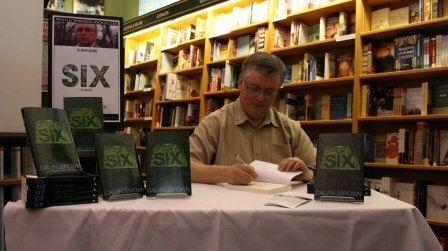 Your novel “Six” recently got nominated for BOTYA Science Fiction Book of the Year award. How do you feel about it? I was very pleased to learn that I was a finalist. It's always satisfying to learn that someone else appreciates the book. Even better when that someone is associated with an award. How would you describe “Six” to someone who has not read it yet? I think I describe it differently every time I am asked. At its core, "Six" is about the accidental emergence of a conscious mind inside a computer system, and how it matures as it interacts with the world, learns, and develops a personality. But there are other parallel and intersecting storylines involving one person’s ruthless pursuit of wealth and power using computer viruses as a weapon, and the efforts of a special police force in trying to track the source. Some people like the different approach the novel takes in telling a tale involving a smart computer. Others appreciate the intrigue and suspense of the overall story. Cal, tell us a little bit about yourself. Where are you from, and what’s your background? I don’t tend to think much about where I’m from – I focus more on what’s next. However, after some deep thought, I’d have to say I’m from rural Manitoba where I grew up, and urban Edmonton and Winnipeg where I have primarily been employed. I’m from the high tech IT world in which I have studied and worked, and the countryside where my wife and I live and love the fields, trees, and wildlife that constitute our immediate neighbourhood and neighbours. I’m from an era where I worked with huge computers that had rows of flashing lights on the front panel, and I’m from a more recent world in which my smartphone has even more processing capability (and sadly, no flashing lights). And I’m from my office in the basement where I’m at home with my computer equipment and surrounded by my books. How did you get into writing, especially what inspired you to become a Sci Fi writer? I’ve always loved reading but didn’t start to develop a serious interest in writing until my early 40’s. In fact, I think my high school English teachers would be quite shocked to learn I have written a novel. 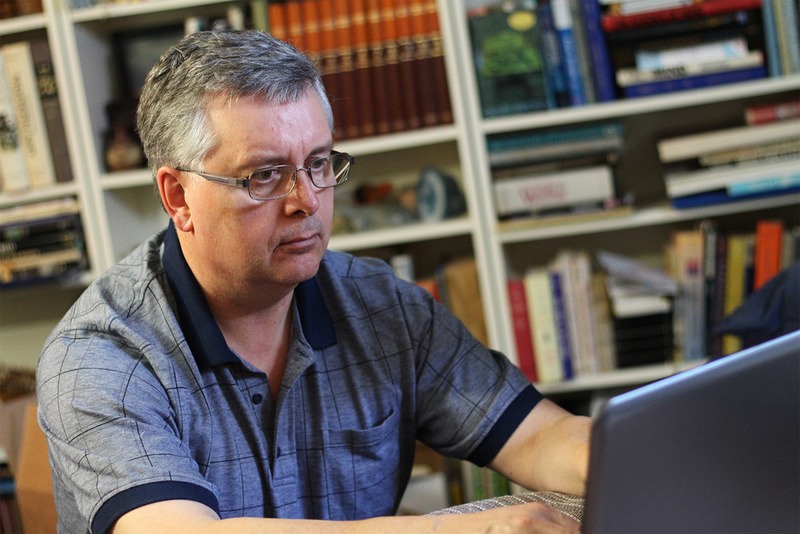 My interest in writing probably started forming when I began teaching computer courses, first in my spare time and later as a fulltime university faculty member. Through this experience, I developed an appreciation of the importance of being both clear and entertaining – a deficiency in either and you soon lose a classroom of hard-partying students. As this appreciation became directed at writing, and as my writing moved towards a novel, science fiction was a natural choice. 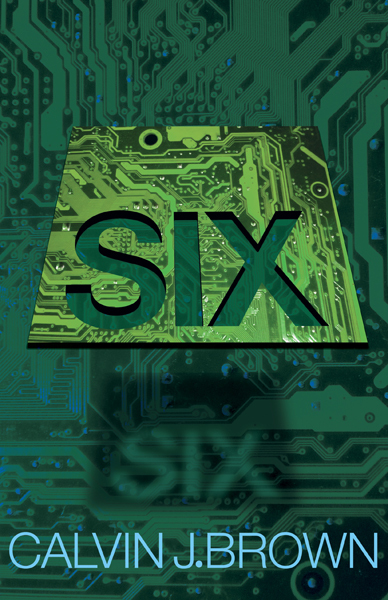 The idea behind “Six” was a natural outgrowth of my studies in artificial intelligence. The fun in writing fiction is that you can go beyond the limits of real life. Going beyond the current reality of AI, which has come a long way since the 50’s but still has much to achieve, was an itch I needed to scratch. Once the prospect of a novel was on the table, imagining what real intelligence inside a computer system would be like was irresistible. So what inspired you to create “Six”? Did any of your favourite authors, stories or their styles influence you while writing it? As I mentioned, the core theme of “Six” came from my background in AI. It’s very hard to say whether particular authors had a strong influence. I assume I am like most book lovers – I tend to read a wide variety of authors. I enjoy the way that early Sci Fi authors like Isaac Azimov and Robert Heinlein explore ideas, I equally enjoy the way action / adventure novelists like Michael Connelly and Nelson DeMille create interesting characters, and I like the way that authors like Alan Gordon and Ken Follett can wind a fascinating tale among historical facts. Did you do any research on similar subjects before writing or was it totally based on your knowledge of science and IT? For “Six” I was able to draw substantially on my existing knowledge of AI and computer technology. However, there were still numerous topics I needed to research. Investment concepts, police procedures, aircraft capabilities, names, and addresses are all examples. Was it hard writing an original story? What were the challenges you faced during this process and how did you overcome them? I didn’t find originality difficult. I had never encountered a story that took the same approach as mine. That’s probably a big part of why I wanted to write it, but that didn’t make writing it easy. The biggest challenge for me was finding the time. I had a fulltime job that provided many challenges, as well as my wife and three daughters whom I have always loved spending time with. It probably helped that my daughters were teenagers when I started, so they were past wanting to play with their Dad. It also helped hugely that my wife, Jane, was fully supportive of my efforts and my need to go into seclusion for a time almost every day. What made you choose the self-publishing route and why FriesenPress? I found the traditional publishing model to be much too restrictive. Even though I thought I had a really good product to offer, I could not get the attention of any traditional publishers or agents. And of course, they make their determination largely on a simple letter and probably by me being an unknown author, not by actually seeing the novel. It is gratifying to now see the many positive reviews that the novel has received lately as confirmation of my belief in the novel’s quality. I looked widely at my options when I decided to self-publish. I ultimately selected FriesePress because they offered an option that produced the novel in all formats – hardcover, paperback, and ebook. As well, it was important to me that the ebook be available in a wide variety of popular formats. To now have the book available from a huge number of online sites, including the big ones, is very important to me. What are the challenges you are facing as a self-published author and what are the strategies you are taking to overcome them? At this stage, marketing the book is a huge undertaking. I am very much trying to give it the attention that it deserves while still prioritizing the myriad of potential marketing tasks with life’s other activities and, of course, getting the next book written. It doesn’t leave much spare time, but it’s all interesting and exciting. What’s next? Are you working on any other projects at the moment? I have another novel as well as a non-fiction book underway. If anyone has a product for stretching a day well beyond merely 24 hours, I wish you’d patent it and get it commercialized. I’d be first in line to buy it. It’s presumptuous of me to suppose that I can yet offer significant wisdom to potential writers. However, that has never stopped me from providing advice before – just ask my kids. So... Stop waiting. Get busy. Expect to generate plenty of mediocre material before you find a topic and develop a style that work for you. The sooner you get started, the sooner you will get to the good stuff. But be sure to enjoy the journey. Click here to own a copy of "SIX"